There are about 700 species of cephalopods (including the cuttlefishes, squids, octopods, and the chambered nautilus) living throughout the seas of the world. They are considered to be the most highly evolved marine invertebrates and possess elaborate sense organs, large brains and complex behavior. 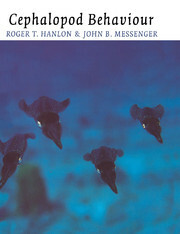 This book examines such behavior, summarizing field and laboratory data from a wide variety of sources in the first comprehensive account of the life of cephalopods in their natural habitats. This book surveys the way cephalopods find prey and escape predators, how they reproduce, how they learn, and how they communicate using complex body patterns. Throughout, the volume emphasizes the gaps in our knowledge in the hope of stimulating more biologists to study these beautiful and fascinating animals. Researchers in animal behavior, marine biology, and neuroscience will find the subject matter especially appealing. Preface; Acknowledgements; 1. Introduction; 2. Senses, effectors and the brain; 3. Colour change and body patterning; 4. Feeding and foraging; 5. Defence; 6. Reproductive behaviour; 7. Communication; 8. Learning and the development of behaviour; 9. Ecological aspects of behaviour; 10. Nautilus; Epilogue; References; Index.